AIRS EVERY FRIDAY AT 9:30 AM! Gary flies in to rescue a landscape or should we say “Superscape". 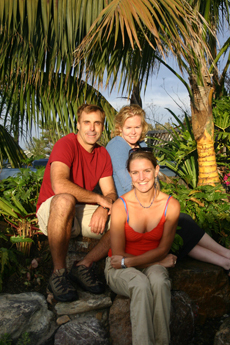 Home and Garden Television’s new series "Superscapes" debuting Sunday, February 1, 2009 at 9:30 A.M. features Gary Gragg’s landscape renovation projects. Based in the Bay Area, the series follows Gragg as he helps homeowners’ fulfill their backyard garden dreams. Viewers accustomed to HGTV’s clever before-and-after format and do-it-yourself inspiration, will not be disappointed. What makes Superscapes unique is it’s likeably offbeat host whose enthusiasm for plants and landscaping is inimitable. Gragg, a self-described “plant nerd”, skillfully operates a tractor in one scene then snowboards down a massive grass hill in the next. While his expertise is truly educational his antics are guaranteed to make the viewer laugh out loud. A landscape contractor and designer for 20 years, Gragg is the owner of Golden Gate Palms & Exotics Nursery in Point Richmond, CA. The three-acre nursery is the largest and most diverse collection of exotic plant material in Northern California! Gragg, who spent his childhood and adolescence hiding his plant passion because it wasn’t considered “cool” amongst his peers, is now on a mission to change the face of garden T.V. and the national view of gardening in general. “I never thought there was enough, or the right kind of garden content on T.V. nor was the content delivered with any appreciable enthusiasm. I wanted the world to know how truly cool gardening really is. If someone did a show the right way, even kids would be hooked.” said Gragg. After guest starring on a few HGTV shows through Golden Gate Palms, Gragg was inspired to buy a camera and documented a behind the scenes look at the design and construction of his 2006 San Francisco Flower & Garden Show project. His exhibit, “Livin’Cheap in Baja” showcased plants native to the varied ecotypes of the Baja Peninsula. But, like everything Gragg does, this garden vignette was botany delivered with a poignant dose of humor. 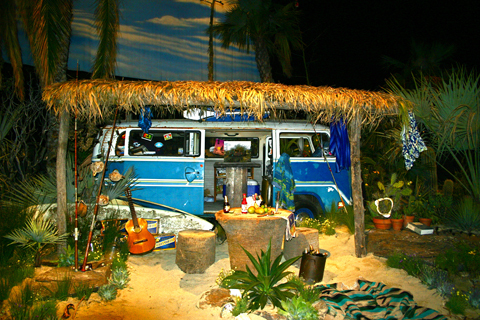 The installation also included Mexican beer bottles tossed into the landscape and a shark bitten surfboard. The SF Flower and Garden Show landscape installation went on to win Best in Show and Gary’s footage caught the attention of Edelman Productions, Inc., based in Marin. 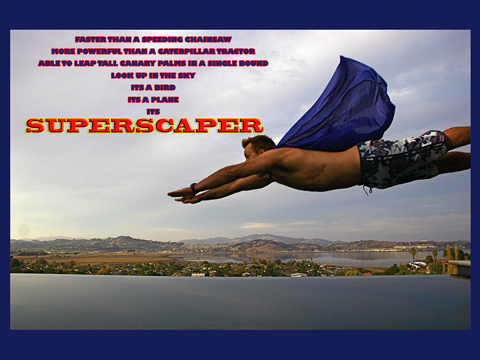 The team pitched the concept to HGTV and a new series was born (Superscapes). “Gary’s energy is infectious. He inspires you to run home and do something to your own, neglected garden,” said Superscapes series producer, Lauren Williams. . 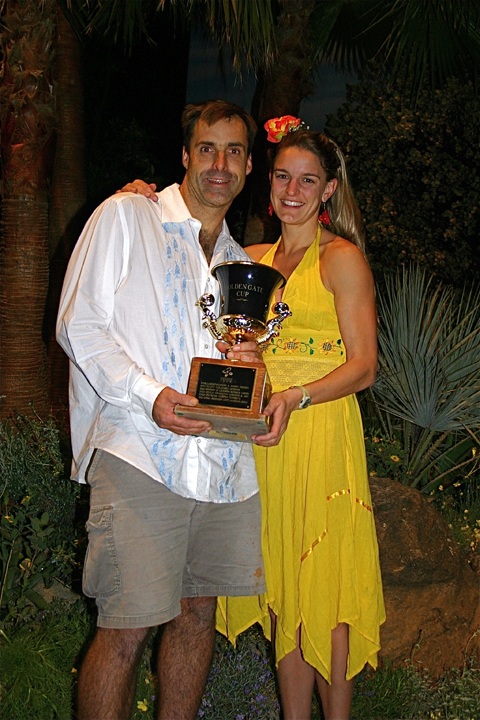 The award winning "Livin' Cheap in Baja" Exhibit from the 2006 San Francisco Flower and Garden Show. The exhibit was both botanically accurate and tremendously amusing. Gary teamed up with UC Davis landscape architecture major Sarah Hayward for the first time on the “Livin’ Cheap in Baja” exhibit. They still work together and Sarah is Gary’s sidekick (aka assistant designer) on Superscapes. Gragg, an East Bay native, brought his local expertise to the national series. 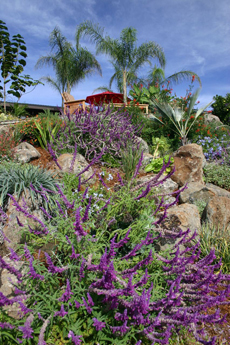 The series showcases numerous Bay Area venues such as UC Berkeley Botanical Garden, San Francisco’s Strybing Arboretum and The Ruth Bancroft Garden in Walnut Creek. Many of the Bay Area’s best nurseries and garden crafts people are featured as well.